I was born in Austria but raised in Germany, where I studied Resource Management at the Faculty of Agricultural Sciences in Goettingen. During my studies I was especially interested in biological control, biodiversity and forest dynamics. 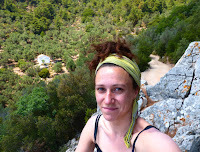 Now, I am a PhD candidate at the Laboratory of Biogeography and Ecology and have the chance to combine and to expand my interests, as my study areas are olive groves, complex agroforestry systems. My research focuses on the factors leading to variations in infestation by Bactrocera oleae at different spatial scales. Therefore, I study the influence of the surrounding landscape composition as well as the impact of aromatic plants growing within the olive groves.